Beer Dave pulls a can of Uinta Trader Session IPA out of his cooler, flips it upside down, looks around and shakes his head. “Need a church key,” he says, heading off to borrow one. Opening it from the top, using the tab Uinta thoughtfully provided, is not an option. Church key—a device otherwise known as a beer can opener—in hand, he pops two triangular holes in the bottom and fills a glass. This is how beer can collectors do it. And Dave Gausepohl, more often simply called Beer Dave, is a collector of all things beer. Beer Dave is also a beer tourist who has visited more than 3,400 American breweries. Beer Dave brewed beer for a living before he began selling beer for a living. Beer Dave’s various hobbies and jobs look much like a Venn diagram, independent but intersecting. “This was good,” he says on another June day, en route to his home outside Cincinnati after visiting White Squirrel Brewery in Bowling Green, Kentucky. He took a picture of the front, as he always does; drank pints of two of the house beers on tap; toured the brewhouse; and bought a glass with the brewery’s logo on it. The guest taps included two beers that he represents as specialty beer manager for Heidelberg Distributing in Kentucky. “So I got to call on an account,” he says. It was the 3,375th brewery he visited since his father took him to the Geo. Wiedemann Brewery in Newport, Kentucky, in 1977. He was 12 years old and had already been collecting cans for three years. 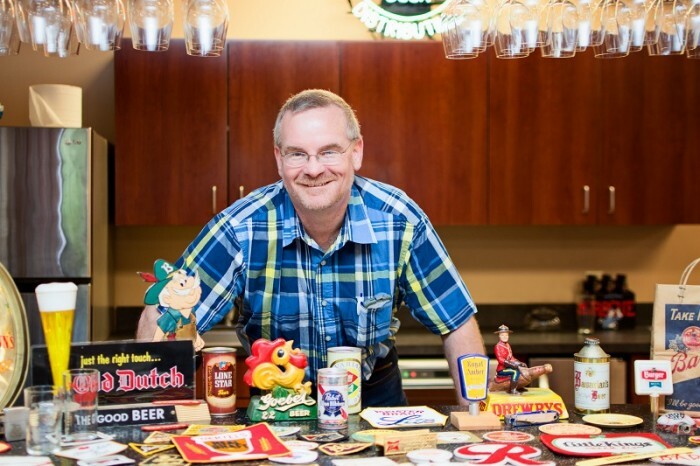 He has about 15,000 now, just a small portion of his collection of roughly three quarters of a million brewery-related items. “Not Haydockian,” Beer Dave says, referring to his friends and sometimes traveling companions, Herb and Helen Haydock, who have acquired two lifetimes’ worth of breweriana. The numbers are something beyond impressive, but they are not how Beer Dave became Beer Dave. When he went to work as the specialty beer buyer for the Party Source, a package store, in Bellevue, Kentucky, in 1995, the store already had a wine buyer by the name of Dave. The office manager suggested he take the name Beer Dave, and two days later a Beer Dave name tag arrived. Friends in his various circles had no problem embracing it. After a Brewery Collectibles Club of America (BCCA) board meeting, his cooler becomes a natural gathering spot. He knows who is more likely to want to try an IPA and who prefers cider. He often also knows what special cans they are looking for. “You’ve got to see this,” he says at mid-afternoon, heading around the corner where a large pile of beer cans sits that will soon be under attack. 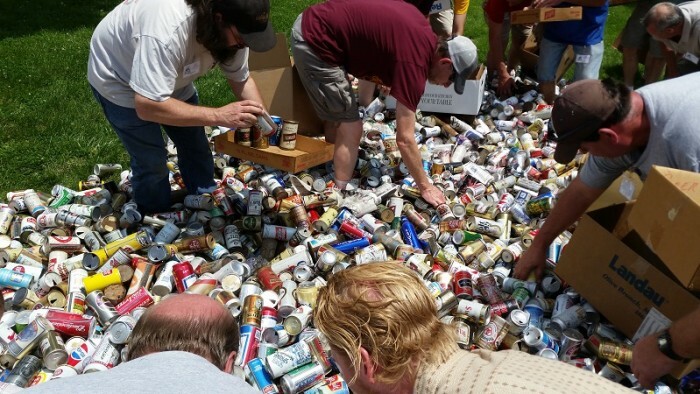 This is called a “can dump.” BCCA members donate cans that they are tired of hauling around, then all who want to wade in to grab whatever catches their eye. He should have said, “You’ve got to hear this,” because cans bouncing off of each other create an eerie metallic chirping sound. “There aren’t going to be any $500 jewels, but maybe you’ll find something that is a little bit better than a can you have, an upgrade. Or maybe a placeholder,” he says, excusing himself when he spots a can—from Rahr Green Bay Brewing Co.—he’ll end up taking home with him. His collection includes half a hand-decorated wooden crate from New Albion Brewing. He particularly treasures it because Don Barkley, who had worked at New Albion and then helped start Mendocino Brewing, gave the crate to Beer Dave and Herb Haydock when they visited Mendocino in 1991. Gausepohl and Haydock carefully pulled the nails from it to split it into two parts. They have a deal that the first to die bequeaths his half to the other. Beer Dave’s boyish looks—accentuated by an impish turn of the mouth when he delivers a pun he is particularly proud of—would fool most carneys, but he turned 50 last December, and it has been more than 40 years since one of his sisters, Sally, handed him an empty 7-ounce can of Pabst that put him in the middle of this Venn diagram. The range of his experience is evident on a Friday evening in May. He sits on one side of the expansive patio of Lexington’s newest brewery, Ethereal Brewing, choosing a spot where he can take it all in. The brewery is located on a former distillery campus, and there is plenty of space for other businesses to fill in around it. Owner John Bishop—who earlier simply identified himself as the father of one of the brewers—is busy rounding up empty glasses. Beer Dave has seen “the dad” chip in plenty of times, but this still makes him smile. “Belgian (style) beer in Lexington. Who would have thought it?” he says, soon talking about the lagers from Blue Stallion Brewing, then a collaboration beer from Country Boy Brewing and West Sixth Brewing released earlier in the day, kicking off Lexington Beer Week. He is people watching. “There’s another dad,” he says. Of course Beer Dave has been there. That’s why he’s Beer Dave. Well, one of the reasons. Stan Hieronymus has known Beer Dave since before he was Beer Dave. He met Dave and Daniel Bradford, then publisher of All About Beer Magazine, on the same weekend in 1993. The three still haven’t run out of beer things to talk about. Nice article David. You’ve got your hands busy now-a-days…we’ve seen a lot during our tenure in the business. Merry Christmas and Happy New Year. Outstanding! A pleasure to read and enjoy. Dave is a fantastic guy with an extensive data base of knowledge known as “his brain”. Clearly deserves all that comes with the title “Beer Dave”. Just awesome!! I used to work with Dave at Oldenberg Brewery in the nineties. Nice to see he continued on that path. Woop woop, thanks for the shout out to White Squirrel and glad Dave enjoyed his visit! Beer Dave and I have been personal friends and associates for many years now. I first met him in 1996. We are both past employees of the now defunct premier microbrewery of the midwest, Oldenberg Brewing Co., Ft Mitchell, KY. I always get a kick out of his beer puns and quips. He must have a million of ’em. I remember his part in Beer Camp at Oldenberg, known as “Stump the Beer Geek”. He always had an answer for ANY question. You were never quite sure whether he actually knew that much about beer related stuff or not. I never saw an answer challenged. Quite a Guy! I stlll have a list of US Breweries he gave me back when he had only visited just over 2000. For those who haven’t had the distinct pleasure of meeting Beer Dave, you don’t know what your missing! I have known Beer Dave for quite a few years. My real name is Patti but Beer Dave gave me the name Ms. Jackson. My hubby & I ADORE him. Dave, you hit the bigtime! I couldn’t believe my eyes when I saw that face on the newsletter preview. See you at the next Heidelberg beer show! Great profile on Beer Dave. A true friend and gentleman. Dave and I have had some fun times talking about beer and breweries. Beer Dave is a walking, talking beer encyclopedia and he remembers faces and names better than anyone I know. I actually met Dave at a brewery (Birmingham Brewing Co.) when we happened to pop in for a tour at the same time. Then he slept on my hotel room floor for three nights during CANvention! Great guy! Great Article about Dave. I’ve never met him but have heard a lot about him from his brother. Thanks for the Rhinegeist! The next time you come up to visit him…we’ll all have to hit some breweries! !